In the last 18 months I have come to understand the power behind journaling for business success. In 2017 I had so many ideas in my head for my business. I had ideas for ways that I wanted to grow my business. I talked a lot about it with my hubby and my mentor, Emma Holmes, but I had nothing written down – I had a few post it notes and a couple of scrappy notebooks and few notes in Trello – to be honest it was scattered – and so was my head – it was everywhere and nowhere. So that night I thought right, well, I’m just going to write whatever comes to my mind. My goodness it poured out… so much so that I couldn’t actually stop writing! I wrote my thoughts, my feelings from that day and in the moment, events, and my wins that day… and I couldn’t believe how well I slept that night! So more writing the next night and the next and that was it, I was on the path to journaling for business success. It was like a whole new hobby for me that I couldn’t get enough of and I just couldn’t wait to write in my journal every night and every day. I then started to introduce ideas for my business in my journal. Adding sketches. Brain-dumping ideas. Mind mapping how those ideas would work. Writing words that would pop into my head. Quotes from books. Sketching logo ideas. I mean I really wrote, sketched and doodled everything. From this point on I became a joyful journaler. 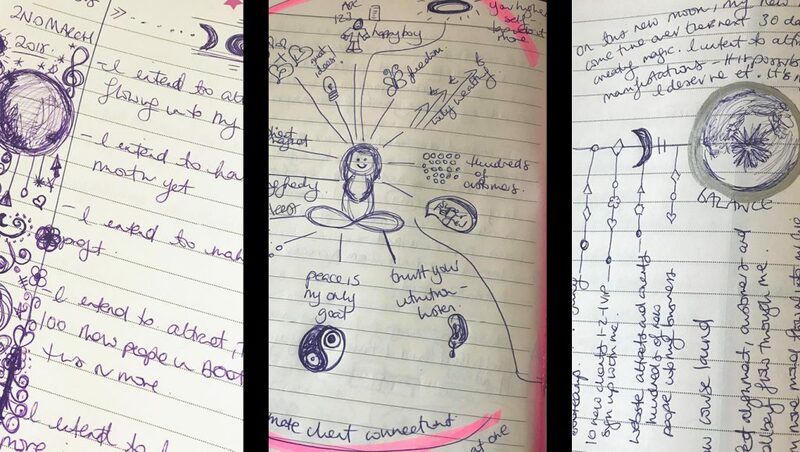 I use my I’m a Flipping Rockstar Journal, which you can purchase here – it’s more than a journal, it’s a confidence and business booster and journal all in one. And I also use some lovely Journals from Paperchase. For a creative like me, and actually, I have always had a busy and super creative mind, it sets me free, empties my head and has made my last 12 months (it took me around six months to start seeing results) in my business even more successful that before – and overall I feel much healthier within my well-being. Banishes any negative thoughts: I write all the things down that I have given any unspent energy too, or anything that has come up in the day. Writing these things/events/thoughts down, allows you to unravel what is going on. “Was it really like that? Was I in a mood at the time? Did I overthink that? Is it really worth bothering about?” I do this for both my business and my personal life – because working from home, my business and my personal life intertwine. Once you start to reveal what is really going on, it’s like a lightbulb being switched on – “ah, so that’s what it is!” And it allows you to move on – it’s like a firework – now you see it, now you don’t – those feelings/thoughts disperse and free up headspace. Writing all this down also nurtures better self-awareness, so the next time if anything happens or comes up, then your coping mechanism is more aware and it doesn’t affect you in the same way. Allows you to scope out great ideas: my best ideas have come from some night time journaling. Taking an empty page and filling it with genius ideas is really cathartic. Working out how it will look, will it work, what I will need to do to make that happen, when can I do this, will I need a day or two for making this happen – I write it all down – like everything – even the silly ideas I might have – because sometimes those, what you think, silly ideas, are the best ones. 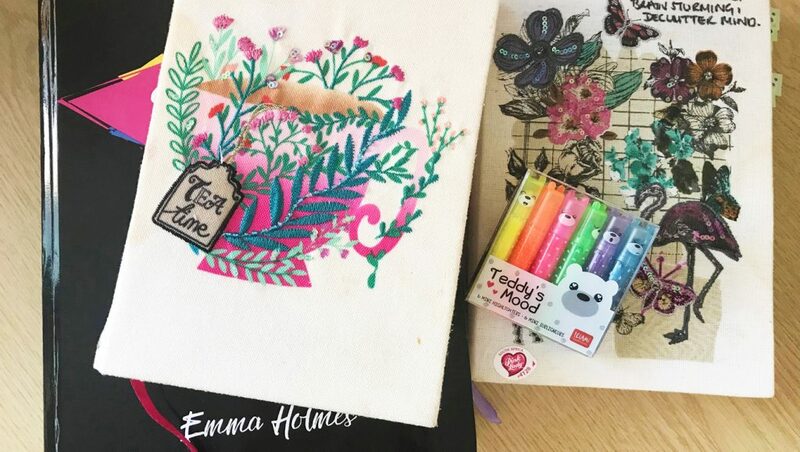 Helps you sleep better: I find that when the house is quiet, everyone is asleep and it’s just me and my journal, my head is still buzzing from school run, teatime, after school clubs and things I need to do in the morning. So for me, again, emptying my thoughts on to the pages is like a release of energy. It creates a sense of calm afterwards and it helps you ease into sleep so much better. Captures all your ideas in one place so you have a record of everything: for me this is a biggie. Before I had several notebooks, post it notes as well as notes in Trello. Now I just have my journal, and then I pull out my best ideas and key goals and pop them into my Happy Planner, which I use just for my business, nothing else. Reflection: it allows me to reflect. Journaling my life onto pages is a snapshot of what was going on for me in that very moment or time in my life and business. I do take the time to read back my journals. I sparks memories and feelings from the past. It’s a fabulous way to look at how far I’ve come. Quite often I’ll read parts and think, wow, I’ve achieved that, completed that or think, that never even crosses my mind anymore. Reinforces positivity: Every morning I do something called ‘Morning Pages’. It’s a concept taken from Julia Cameron’s book, The Artist’s Way. Now she knows how a creative mind works, so it’s right up my street. But it works for anyone and everyone. So what do you do? Dead simple… every morning, the first thing you do is write. Three pages if you can. Not about any one thing – just write what is in your mind and what comes to mind. It sounds super simple and like it isn’t really going to do much but you will actually be amazed…. the half ideas, the things you’re thinking about and don’t realise. It’s amazing the clarity and the insight I get from doing this. Within Morning Pages I also do one of Julia’s other rituals called, I AM… all you do is write I am and then spill your words onto the pages… I am feeling resistant to the changes I need to make today, I am a prolific designer, I am doing this, I am tired today, I am going to win the day… everything and anything, even if you just write one thing – it just reinforces your feelings, positivity and thoughts for the day. And the more you try and get in to the habit, the more it frees up your head too. I feel a bit all over the place for the day if I don’t do it! Affirmations & Quotes: I write all my affirmations in my journal as well as quotes from books that have resonated with me. Affirmations really work for me, they magically give me that reassurance and zest to have belief in myself that I can do this. If you struggle with what to write, start simply by writing what you want to achieve or feel and write in the present. So for instance, “I am an incredible business woman attracting new clients every single day in my business.” Even if you haven’t even started your business yet, write it like it’s happening NOW. So one of mine is, “I make money whilst I sleep.” Which ties in with my scalable business model I have put into place recently. Also I write out some of the best quotes that I love. The key here to affirmations and quotes is to read them back, regularly. Or rewrite them, or say them out loud to yourself or whilst looking in the mirror – layering up and reinforcing positivity. Set Goals: I set myself goals in my journal, I write lists of all the things I want to achieve – but it’s not set in stone, it’s changeable and every growing. If you want to write a book, what will that do to your life? What has to be done to achieve that? Get it all down in your journal… Do you want to make £2K every single month? Great, then what do you have to do to make that happen? Gratitude: ah, now, gratitude is a game changer. Writing down one to five things a day you are grateful for really is life-changing. Whilst many of the other reasons I’ve given you to journal for business success talk about the past and the future, gratitude, is really all about NOW, in the present. What are you grateful for right now in this very point, moment, day in your life? Is it the sunshine? The cosy bed you lay in? The fabulous meal with great friends last night? The bank balance you have to keep you safe? The fabulous customers you work with on a daily basis? The webinar that is coming up today? What is it in NOW you are grateful for? There is power behind the “I am grateful for” statement because it highlights what you have right now, in this very moment. It has a way of connecting me to my family, my business and my life – it actually makes my heart all fluttery too when I do these. Try it and you’ll see! Manifestation: working with cycles of the moon is something that I have only done in the last 18 months. I now work with the moon phases to help me manifest certain monthly goals. When it’s a new moon I write on the night of the new moon, my intentions for the month and what I would like to manifest in the coming weeks until the next new moon. I do this also on the full moon – I let go of what is not serving me, writing this all down is so powerful, it really enables you to just let go and release it into the universe. No judgement, no one questioning, just you and your musings. Action: this is the BIG one – because without action then you can’t manifest, achieve or build a successful business. It’s just not possible. You can write down everything you want for your business, how you want it to look, how you want it to feel, your goals and what you want to attract into your business BUT you must take action in order for that to happen. It won’t happen otherwise – YOU are the key to making the success happen in your business. 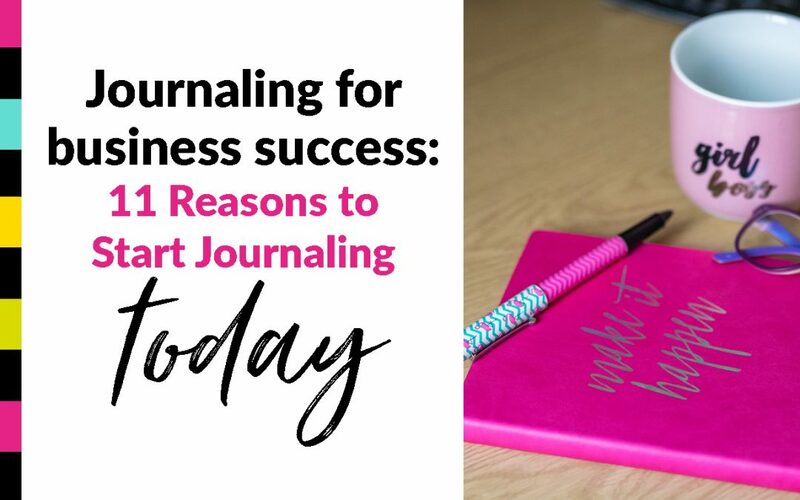 Journaling is key to building a successful idea fuelled business BUT without you actually doing any work – it JUST. WON’T. HAPPEN. You must take action to build the course you want to get out there, you have to write the blog you want to write, you have to create a website to attract those customers… I think you get the picture. Dreams are incredible and super powerful but you need to take the energy momentum from your ideas and thrust them into action. Those are my 11 reasons to journal for business success and it can be quite daunting at first. But, if you just think to yourself, “I am journaling without judgement, I am writing what I feel, there are no wrongs and rights, I feel better when I journal,” I guarantee you will build an incredible business and build better relationships, just through journaling. It opens up your channels of communication, and I know from personal experience I am able to talk through any issues I feel or have in much more positive way. I doodle – quite a bit – I find it so relaxing – words, sketches – anything! You can see how journaling for business success is just pure gold. I do hope this helps you on your path to becoming a journal junkie, like me, and I’d love to know how, you, personally use journaling in your life. I’d love to know, do you journal? I find I have so many books and journals that I start and then I always get sidelined by work and life throwing me curved balls. so next year I’m determined to make more time for me and to work on journaling to gain more mental clarity and free up my head space. I really enjoyed this post thanks. I’m going to give it a try as I have more ideas than time! And I agree about working from home and our personal and work lives linking together.